One of the cleanest and well-planned city in India, Chandigarh is always a whirlwind of activity, with famous sites at every turn and never enough time to see them all. Even if you’re not mesmerized by the city’s soaring shopping malls and flashy food street, you’ll be blown away by its flourishing arts, food, fashion and nightlife scenes. Even better, many landmarks are free to visit, while others are available with discounted entry or with special offers. There are also plenty of kid-friendly places to visit in Chandigarh. There are plenty of breaks to choose from, whether you are coming for a day trip or for a whole weekend in this wonderful city. Sukhna lake was constructed in 1958 and spreading over an area of 2600 hectare.It is situated at 1 Km. in the North-East of Sukhna Lake.It is an abode of the wide variety of Mammals, birds, reptiles, butterflies and micro-organisms, some of them which are popular are: Sambar, Spotted Deer, Wild boar, Jackal, Jungle Cat, Porcupine, Hanuman Langur, Indian Hare, Common-Mongoose, etc.Apart from that, there are a wide variety of birds including aquatic birds. Prominent among them are Peacock, Red jungle fowl, Grey partridge, Cuckoos, Golden Oriole, Kingfisher, Swifts, Hoopoes, Hornbills, Barbets and others.There are large varieties of reptiles including snakes like Cobra, Rat snake, Common Krait, Russell’s viper, Indian Python etc. The International Dolls Museum, Chandigarh was established in 1985 and one of the best museums among all present in India.This place is not for children but adults also find it attractive to revisit their childhood memories.With such a huge collection of dolls present in this museum.It appears to be a completely new world. Apart from the dolls, you will found Toy Train is also very assuming.The replica of German Railway station is a special attraction with a background made of ceramic fresco depicting the milestones of various countries. It is also known as Nek Chand’s Rock Garden after its founder Nek Chand. The most interesting thing about this place is that it is completely built of industrial and home waste and thrown-away items.It consists of man-made interlinked waterfalls and many other sculptures developed from scrap and other kinds of wastes (bottles, glasses, bangles, tiles, ceramic pots, sinks, electrical waste, broken pipes, etc.) which are placed in walled paths.The garden is visited by over 5,000 people daily, with more than 12 million visitors since its inception. Zakir Hussain Rose Garden Asia’s largest Rose Garden and is spread over 30 acres of land having over 1600 different species of roses.Every year, either at the end of February or beginning of March, a big festival known as Rose Festival is celebrated at this garden which lasts for a week. Over 20,000 people visit this festival. It’s one of the great celebrations in the city. There are lots of competitions, cultural celebrations and many other events. Le Corbusier Centre has been established by the Chandigarh Administration, at the old Sector 19 office of the city’s architect, Le Corbusier. The Swiss-French architect used the office while conceptualizing the city almost six decades ago.The Centre exhibits the life and works of Le Corbusier, so that tourists and future architectures may be able to acquaint themselves with the rich cultural heritage of the city.The ultimate goal of the Centre would be preservation, interpretation, research, display of the works and legacy of Le Corbusier. The Garden of Fragrance was built in 1998. 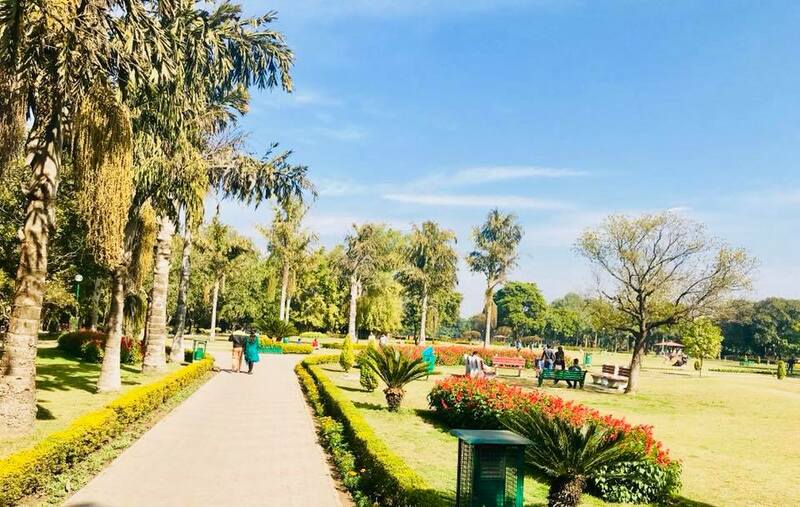 The garden is famous for its pleasant smelling assortment of flowering plants, and hence the name, ‘Garden Of Fragrance’.At a distance of 4 km from Chandigarh Bus Station, Garden of Fragrance is one of the celebrated gardens located in the heart of Chandigarh. The garden is one of the best picnic spots in Chandigarh and also one of the popular Chandigarh tourist places. Elante is one of the coolest cultural hubs of the city. It is a unique development project that is equipped to cater not only Business but also Stay & Entertainment for the masses and the classes in & around the city. It is the largest shopping hub in Northern India and the tenth largest in India.Elante Mall hosts retailers of various Indian and international brands, a food court and a courtyard full of cafes.